Further Comments: TVNZ reported that performer Robbie Williams would often feel the presence of Catherine at his home, which was once her barn, although the entity was not scary. Further Comments: Once an orphanage, it is thought the ghost of a woman that walks the corridors is a mother searching for her lost child. It is unclear whether the same entity is to blame for the wailing and screaming also reported onsite. Further Comments: This shade is said to haunt the hotel, though much of the original building has been replaced. Further Comments: These three figures return once in a while, re-enacting a scene that happened in the dark ages when they first met to discuss the Norse threat. Another phantom reported here is Lady Dacre - she was walled up alive with her dead lover after her husband discovered her illicit affair. Her phantom sobs and screams can now be heard. Further Comments: Dressed in black armour, this ghostly figure was observed several times walking along the road during the Second World War. Further Comments: Mayne, said to have been King Charles I's executioner, spent the last years of his life in a cave in this area after being stripped of his property and funds. His ghost is said to haunt the folly, even though it was constructed many years after his death. Further Comments: No one can say for sure whether the ghost reported is that of Queen Henrietta, who once resided here. Further Comments: This yellow monkey has been seen several times, though only recognised as being a monkey recently. 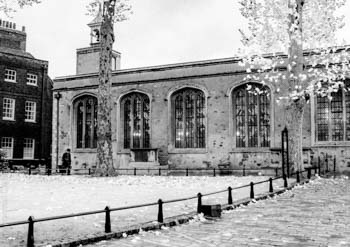 Two other ghosts have been seen here; Lady Anne Douglas walks carrying her severed head, while a little girl has been seen in a bedroom, floating a few feet off the floor. Further Comments: A phantom couple are said to walk arm in arm through the gatehouse of the castle ruins. 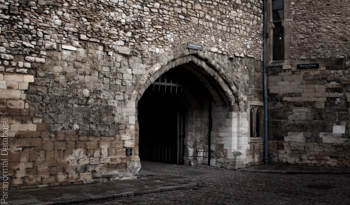 A ghostly Lady Jane Grey has also been reported on site, as has a grey lady who is thought to be Dorothy Beaumont - she may be the entity which pushed a man down the keep's spiral staircase in 1998. Finally, the clash of swords has also been heard here. Further Comments: Looking concerned, this ghost seen near Prince Charlie's room has been named as the man himself, though others say it is more likely to be another Jacobite. Further Comments: Long died of complications from a stomach ailment following her husband's bankruptcy (although many myths incorrectly state she committed suicide after she lost her fortune to a series of bad judgements of an immoral lover). Her ghost lives on in the park. Elizabeth I's spectre is also rumoured to pass across the grounds in a coach, en route to meet the Earl of Leicester. Further Comments: The close friend of Queen Victoria, Mr Brown has been reported on site post-mortem. Further Comments: The Duke of Norfolk, who spent much of his time and money here, lost his head after upsetting Queen Elizabeth and now ascends the staircase of the great hall. Outside the buildings, a monk has been seen flitting between the courtyards of Washhouse and Masters. 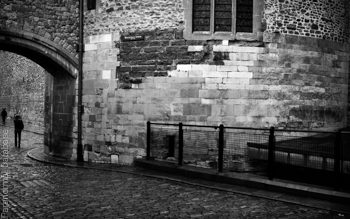 Further Comments: The area in which Henry VIII's armour is normally stored has an evil reputation; several stories exist of guards being either attacked or feeling threatened by an unknown force. 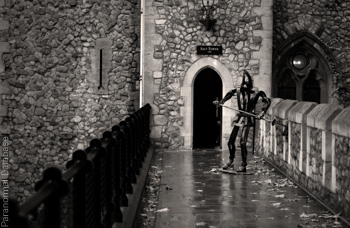 The armour is now on display in the White Tower, and it is not known whether this force has relocated. Further Comments: Believed to have been killed on the instruction of Richard III, the two young princes have been seen holding hands, cowering in various rooms of the tower. In 1990, two Coldstream Guards heard two young children giggling just outside the tower, accompanied by a bouncing sound. The Bloody Tower is also home to the ghost of Sir Walter Raleigh, who wanders around the area and also along the battlements now known as Raleigh's Walk. One visitor reported seeing a phantom woman in a long black dress standing by a window; the witness had time to see the figure was wearing a white cap and a gold pendant before the figure melted away. Further Comments: The phantom of Lady Jane Grey once haunted this tower, though it is now over fifty years since last being spotted standing on the roof. Date / Time: Late nineteenth century? Further Comments: The bodies of the executed were placed under the floor of this building during the Tutor period. In 1876, Queen Victoria instructed the flagstones be lifted and all bodies removed, identified and given a correct burial - the remains over two hundred were discovered, though identification was nigh impossible. Soon after this, an officer on patrol reported looking into the church late at night and seeing a large number of people in period costume apparently walking around, following a woman who looked like Anne Boleyn. After a few minutes the scene faded away. Further Comments: Refusing to kneel before the axeman, Margaret Pole was chased around the area and hacked to death by him instead. This horrid scene has been witnessed several times, as have the spirits of Anne Boleyn and Lady Jane Grey. Further Comments: Queen Isabella and Lady Alice Hungerford are said to engage in a bout of fisticuffs in this churchyard, both jealous of each other's beauty. A small ghostly greyhound is reported to run between the gravestones. 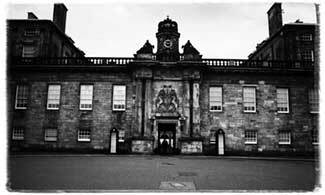 Further Comments: Mary Queen of Scots, Lord Darnley and Mary's private secretary all haunt this building. A naked ghost, Bald Agnes, appears in the garden - Agnes was striped and tortured on the belief that she was a witch in 1592. In addition, the outer door of the Queen's apartments is said to be stained with Rizzio's blood that will not wash away.